Students Celebrate America during Miller Place High School Homecoming. 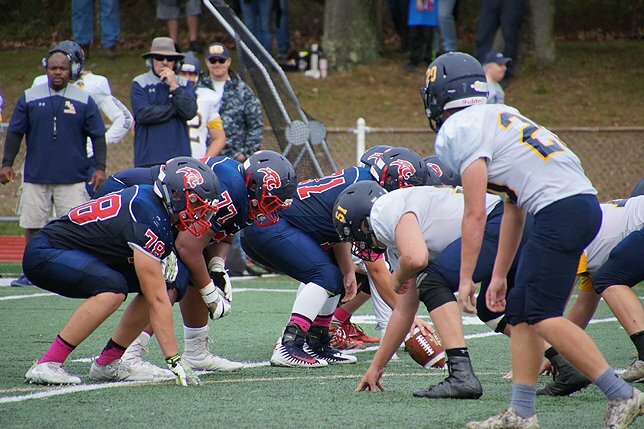 Miller Place High School football players play an intense game against Shoreham-Wading River. Miller Place, NY - November 1, 2017 - The Miller Place School District’s Miller Place High School recently held its annual homecoming parade and football game to celebrate the spirit and excitement of the Miller Place community. The parade featured student-designed and decorated floats celebrating the history and culture of great American cities. Homecoming King Matthew Buscemi and Homecoming Queen Moksha Mehra rode in the senior class’s New Orleans-themed float. For more information about the Miller Place School District, please visit the District’s website: www.millerplace.k12.ny.us or www.millerplaceinthemedia.com. Subject: LongIsland.com - Your Name sent you Article details of "Miller Place School District Celebrates 2017-2018 Homecoming"